A very interesting presentation that captures your audience’s attention and keeps them glued to their seats is something that offers variety and different visual elements. You can avoid giving a bland presentation using beautifully designed presentation templates such as the one we will discuss in this article. The Four Seasons PowerPoint Template uses the beauty and variety of the seasons of nature to add an interesting touch to any kind of presentation. 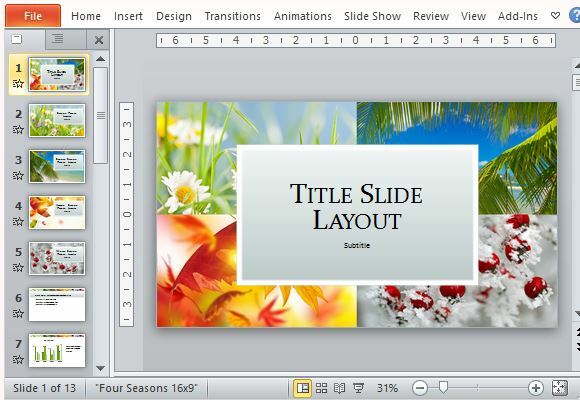 This nature-inspired presentation template shows different pictures representing the various seasons: spring, summer, autumn and winter. The theme of the template makes it perfect for travel, tourism, environment, fashion, food, and even business related topics. 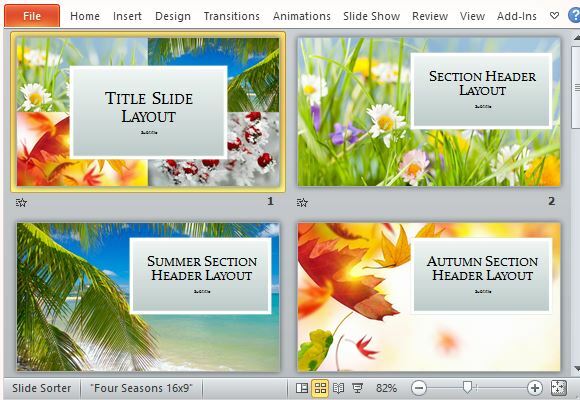 The Four Season PowerPoint Template contains 13 slides that are professionally laid out to allow you to present your information in various ways that are informative and still eye-catching. This PowerPoint Presentation Template contains a title or cover slide where you can type your own title right in the middle of the slide. From this cover page alone your audience will already have a good idea what your presentation topic is. The succeeding slides are designed to have a cohesive, uniform look to match each other. There are close-up pictures of blooming flowers, frosted buds, the sea shore, autumn leaves, snowy grass, and many more. The design of the template allows you to include graphs, charts, lists, text and images into your slides and truly make the template your own. The charts and tables are already built in with the template so it is easy for you to simply exchange them with your own data. The other layouts contain headers and sub-headers, and you can simply duplicate as many slides that you need to complete your own presentation. 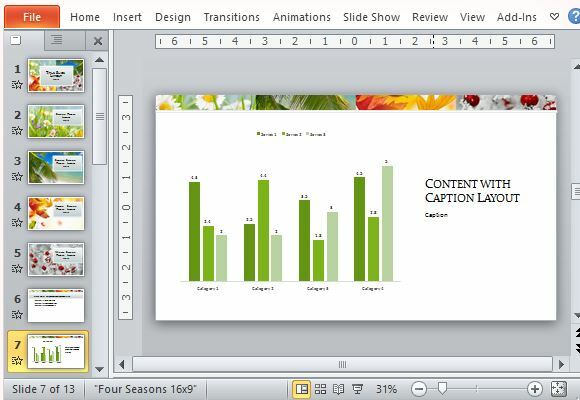 This Four Seasons PowerPoint Template is designed for PowerPoint 2013 but also works with earlier versions.